The Universal Transverse Mercator (UTM) system applies the Transverse Mercator projection to mapping the world, using 60 pre-defined standard zones to supply parameters. UTM zones are six degrees wide. Each zone exists in a North and South variant. 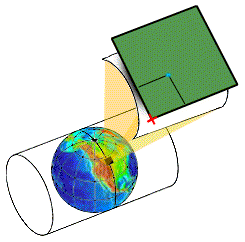 The Universal Polar Stereographic projection is used in the UTM system to map polar regions. Europeans can best understand UTM by thinking of it as a world-wide version of the Gauss Kruger system, which is also based on a regular system of Transverse Mercator projections that each map a zone six degrees wide. (Americans can think of the Gauss Kruger system as a version of UTM with zones defined for European and Asian coverage). Universal Transverse Mercator Zone n (N) - The Northern Hemisphere projections for the infamous UTM system consisting of 120 zones (60 different zones with North and South variants of each). Originally developed for military use and now widely misused in civil mapping. Universal Transverse Mercator Zone n (S) - The Southern Hemisphere projections for UTM. These are mainly distinguished by each having a Northing parameter of 10 million so that no coordinates need involve negative numbers. To use a UTM projection, click on the Universal Transverse Mercator Zone n (N) heading in the projections categories for Northern Hemisphere regions and on the Universal Transverse Mercator Zone n (S) heading for Southern Hemisphere regions. n should be the zone from 01 to 60 desired. See the Projections Tutorial topic for more info on projections. This requirement is met within all State Plane zones that use Transverse Mercator projections. The Mercator projection maps the world onto a cylinder where the central ring of tangency is the Earth's Equator. 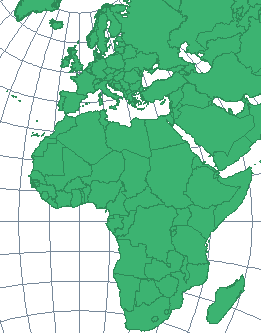 Near the Equator, the Mercator projection provides low distortion. Away from the Equator distortion becomes very high. This limits the utility of the Mercator projection to regions near the Equator. That is a big limitation because most places that people live (and thus, most of the regions that people most frequently map) are located not along the Equator but along North-South directions, such as from North America to South America. Turning the Mercator projection's cylinder so that it is tangent to the Earth along a meridian (longitude line) instead of the Equator results in what is called a Transverse Mercator projection. If we created a Transverse Mercator projection that had a meridian as the central ring of the cylinder we could make local maps anywhere along the North-South line of tangency. If the maps are limited to the thin, vertical region near the meridian of tangency they will be relatively free of distortion. The problem is that any Transverse Mercator projection created by choosing any one meridian as a line of tangency is useful only near that meridian. If we pick a North-South line running through Athens we can make maps all the way from Scandinavia down the length of Africa, but any maps using this projection in North and South America would be hopelessly distorted. The Universal Transverse Mercator system of projections deals with this by defining 60 different standard projections, each one of which is a different Transverse Mercator projection that is slightly rotated to use a different meridian as the central line of tangency. Each different centerline defines a UTM Zone. The UTM Zone is a shorthand way of naming a specific, different projection that consists of a Transverse Mercator projection using a different meridian as the centerline. By rotating the cylinder in 60 steps (six degrees per step) UTM assures that all spots on the Earth will be within 3 degrees of the centerline of one of the 60 cylindrical projections. To map any spot on Earth, one picks the UTM Zone centerline that is closest to it and then makes a map using that UTM Zone's cylindrical projection. Novice UTM users usually do not realize that each UTM Zone is in fact a different projection using a different system of coordinates. New users of UTM therefore will frequently attempt to "combine" different maps created in different UTM zones into one map with the expectation that the combined map will show all objects with low distortion as did the original maps. The motivating factor is often a desire to create a map centered on a region of interest that spans several UTM zones or which is centered between two zones. Such plans fail to take into account that UTM is an intrinsically inflexible system. In effect, the UTM system assumes objects from different zones will never be seen together in the same map. Combining objects from different UTM zones into a map that is projected using only one of those UTM zones will result in distortion in the locations and shapes of the objects that originated in a different zone map. Geographic shapes that look good in a transverse Mercator projection centered upon a given UTM zone line will be very distorted when illustrated in a UTM projection centered upon a different zone line. The illustration above shows part of Europe projected into UTM Zone 2 in the yellow map. Overlaid on the yellow map is an Orthographic projection centered on the same map center shown in blue color. 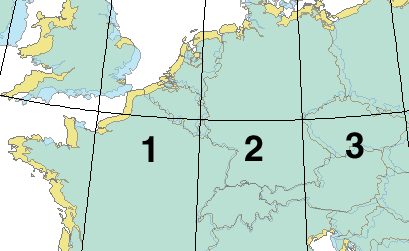 The numbers are positioned at the center of UTM Zones 1, 2 and 3. The Orthographic map is essentially accurate over the entire illustration. In contrast, the UTM map is highly inaccurate only one half zone away from the "home" zone. Note that it distorts the coast of France so much that it has France (in the yellow, UTM projection color) crossing the Channel. If we need to combine objects from several different UTM zones, the correct solution is to choose a different projection (such as a conic or azimuthal projection) for the combined map that provides low distortion over the entire region of interest. The illustration above shows a Lambert Conformal Conic projection in black outline and darker blue color overlaid over the Orthographic projection. Note that both projections are so close to each other it is difficult to pick out places where they differ. 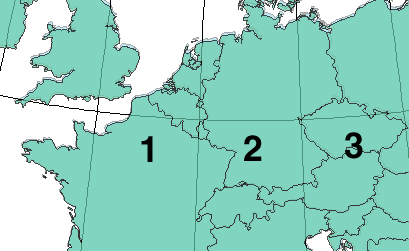 For example, in the region of France where the UTM projection had the continental landmass crossing the channel there is a very slight North/South offset but otherwise the two projections are virtually the same. Remember, although no projection is perfect for all uses some projections are better than others in the uses for which they were designed. UTM was designed to map objects within one zone at a time. It is a very bad choice if objects from several zones must be shown together on the same map. Like the State Plane Coordinate System or Gauss-Kruger, UTM is a living fossil. It was created for use in expert hands as a means of dealing with the technological limitations of an earlier era. When used with skill as originally intended it still functions well within its intended uses. The problem with UTM (as with the State Plane and Gauss Kruger systems) is that it is frequently misused by inexpert users who do not realize the limitations built into the system. See the Transverse Mercator projection topic for a note on Carl Friedrich Gauss.